You Wouldn’t Wear A Fur Coat Into A Sauna – So Why Would You Leave Your Dog In A Parked Car? Now that you’ve recently had your eyes opened to dangers of flying dogs in moving cars, (Man’s Best Friend – Shouldn’t He Wear A Seatbelt Too?) I thought mid-summer would be the perfect time to talk about parked cars and your beloved pet. Every day, people around the world take their dogs (and sometimes cats, rabbits and ferrets) with them in their vehicles for trips of various lengths and reasons. Lots of people take their dogs with them everywhere, unfortunately they often don’t think about the dangers that can develop for their four-legged friends while they’re out and about. If you like to take your pet everywhere you go, sooner or later you’ll be faced with the dilemma of what to do with him when you have to pop into a restaurant or store. Most places of business don’t allow dogs – no matter what their size, or how cute they are – so now what do you do? Surely it’d be okay to leave them just for a few minutes with the windows open a crack … wouldn’t it? NO!! It’s completely obviously to people that you shouldn’t leave a baby inside a parked car all alone – and you surely wouldn’t put your baby in an oven! So why would you even consider abandoning your best furry friend in your car … this is tantamount to putting your best friend in an oven! Every year, dogs are left unattended in cars by owners that just don’t think. People don’t realize that it doesn’t have to be hot out – just warm and sunny, even with the windows open – for the temperature in your car to rise quickly enough for your dog to suffer brain damage – and even death! Did you know that on a summer’s day of only 29 °C even keeping the windows slightly open won’t stop the inside temperature from climbing to 138 °C in 10 minutes, and to 48 °C in 20 minutes. 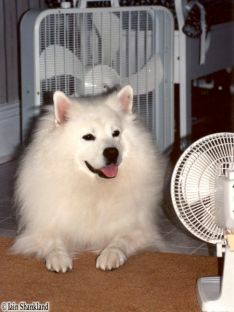 A dog whose body temperature rises to 42 °C within a very short time can suffer irreparable brain damage — or even death! If you don’t believe a word of this, try sitting in a parked car with the windows open that sliver that you usually would for Rover …. See how long you can stand it before you need to get out. Now, remember – if you’re hot, think about the fur factor and the fact that animals do not have sweat glands to cool their bodies like we do. Now really … do you think it’s a good idea to leave your furry friend in the car? Be kind to your pet … if you can’t keep your pet with you at all times, and you may run the risk of leaving them in a parked car … leave them at home where it’s comfortable and safe – it’s the kindest thing to do. If you do have to travel with your pet, there are many precautions that you can take – so be a smart pet guardian and do your research – it could mean life or death for your best friend. While we don’t advocate leaving your pet in the car in warm weather – if you MUST leave your dog in the car on rare occasions, there are products available that are designed to keep your dog cool, not to mention some common sense factors that should come into play. • First of all park under a large tree if one is available – yes you may have to walk a little further to the store, but it’ll be better for Rover and there’s less chance someone will walk by and tease him too. Failing that – look for a shaded area of the building to park in. • You can purchase car shades (the pull-down kind for kids are readily available at Wal-Mart) and reflector sun visors (available at the dollar store) to keep temperatures down. • There are also window vent guards that allow you to leave car windows open quite wide but they prevent your dog from jumping out. • Canine Coolers – thermo-regulating sleeping mats that help keep your dog cool in the heat may also be purchased and used in a vehicle – but it should be noted that these too will be far less effective thanks to soaring temperatures in these small enclosed places. • Some dog professionals use battery or solar powered fans to provide a cooling breeze for car-bound canines – there are also ones that plug into a cars power point. 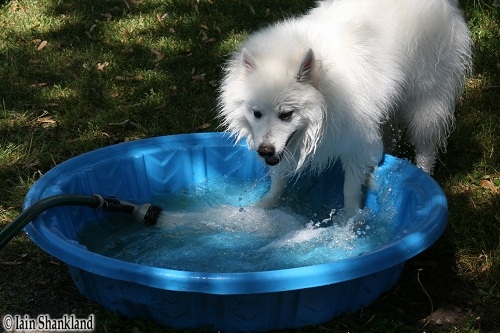 • Most importantly, always have cold water for your dog to drink. They’re used to having plenty of water at home – they need to be continually hydrated, and even more so in the car or after exercise at the park. If you think you’re uncomfortable on a hot day, try walking around in a fur coat! Another word of caution: If you choose to leave your dog in a car unattended on a warm day, be prepared to return to a broken car window and a missing dog – the general public has become aware of the danger to dogs in cars, and will quickly call the authorities. I’ve seen it happen and it wasn’t even a warm day. Many municipalities are vigilant in protecting animals today and they don’t hesitate to take whatever steps are necessary to save your dog. Alternately – don’t hesitate to call the SPCA or the police department if you see a dog suffering from the heat. For more information on this topic, visit http://www.MyDogIsCool.com to educate yourself and others about the dangers hot weather poses to dogs, how to spread the word about preventable pet tragedy, how to keep your pet cool, travel tips and more. This entry was posted in Travelling With Man's Best Friend and tagged #autoblog, #autonews, Automotive, Canine Coolers, cars, MyDogIsCool.com, Road Test, Test Drive. Bookmark the permalink.